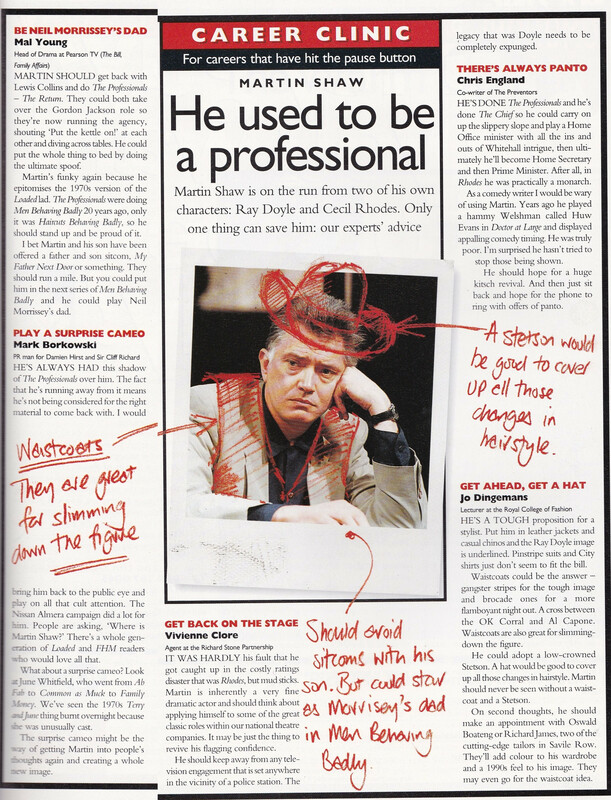 "He used to be a Professional"
Here is a debate on Martin Shaw's career from an issue of TV magazine The Box which was published in 1997 (only 3 instalments). This was when The Professionals was being repeated by Granada Plus and Shaw was having some trouble getting used to the flop that was Rhodes on BBC1. Well he certainly didn't stay away from police roles ! The Chief, George Gently, does a judge count in 'Judge John Deed' or a priest in 'Apparitions'. (I hated that series. Only watched two episodes or maybe one and a half). Ok so I 'imdb' searched him as I can't remember all his roles. They say that he has been in 100 tv roles. Gosh that's an amazing career.